The 4th generation blockchain is aiming to revolutionize the blockchain technology. It assures to bring us closer to mass adoption than ever before. Before we explore that, let’s swiftly check out the three transformative stages blockchain innovation has gone through since 2008. The 1st generation of blockchain was designed by Satoshi Nakamoto and also led to the first ever cryptocurrency Bitcoin. The 1st generation blockchains utilized the Proof of Work (PoW) consensus algorithm to verify purchases. Ethereum led the 2nd generation of the blockchain. The project introduced the idea of using smart contracts with blockchain technology. It ended up being widely prominent with developers. Ethereum introduced the idea of POS (Proof of Stack) as POW consume a lot of energy. It leads the blockchain to worldwide adoption. The new projects started developing their decentralized application using the Ethereum platform. It also provides the platform to new coming projects for building decentralized applications. NEO and WAVES are also leading projects of 2nd generation blockchain. The 1st two generations of blockchain failed to provide the users with scalability and efficiency. The low transaction speed resulted in slow purchases. The high network fees and high energy consumption force the developer to introduce a next generation of the blockchain. There are still numerous problems with blockchain. 3rd generation blockchain is trying to address the issue with scalability, speed, and also power efficiency, by utilizing approaches like POS with off-chain transactions and sharding technology. Cardano, Zilliqa, etc are the leading 3rd generation blockchain projects. Now, let’s have a look at 4th generation blockchain. 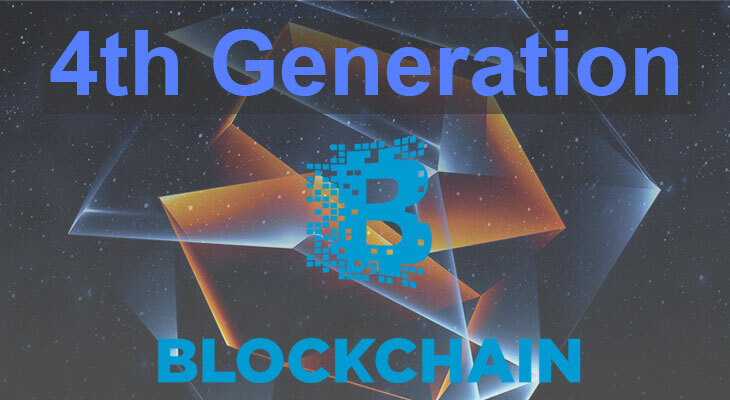 Here is an awesome article Blockchain Generations Explained in 2019. The blockchain is still in its early phase. It is growing over time, and the businesses around the world are adopting it rapidly. 4th Generation blockchain aka blockchain 4.0 is also making its way to market. The fourth generation blockchain is aiming to resolve all the issue with the previous three generations. Different companies are trying to provide the world with a scalable, adaptable and affordable blockchain. Businesses are ready to adopt the blockchain technology, but we need a more secure and flexible blockchain. As the blockchain applications are increasing over time, we need a more powerful blockchain technology. The ‘4th generation blockchain’ is using advanced technology to meet the user’s requirements. We will discuss the leading projects that are working on fourth generation blockchain. The article will also discuss the new technology behind these projects. Multiversum is trying to introduce the world with “4th generation blockchain”. The project will use complicated data kinds as well as the organization in multidimensional structures, similar to relational data sources. The company aims to provide the customers with tools that allow the generational leap to a reliable Blockchain 4.0. This blockchain will be able to create synergies between cryptocurrencies and to adapt to their particular needs, splitting and rejoining itself. It will also let the customer having an efficient and quicker data flux, which can handle them in a complex structured universe. The new technology like data sharding, chain splitting and rejoining will help in getting higher scalability and parallelism. Multiversum is aiming to replace PoS (Proof of Stake) with PoI (Proof of Integrity). Proof of integrity will provide us with a highly scalable and low energy consuming blockchain. The new technology will help in transferring the funds in 0.2 seconds from one wallet to another. The company is also claiming to have a transaction speed of 6400 TPS. Metahash is another leading project that claims to be the 4th generation blockchain. This project is introducing the new technology that has the potential to replace POW and POS consensus algorithms. MetaHash is using MPOS(Multiple Proof of Stack) algorithms to carry out transactions. This algorithm let everyone to involve in the mining process. All you need is to buy some metahash and become part of the network. You can easily start mining by following simple steps. You can also start forging to earn some Metahash. The company is struggling to have a transaction speed of 100,000 TPS on each node. The aim is to provide quick and reliable transactions of any assets at a reasonable fixed price. Meta hash is also providing the fast, secure, and decentralized platform for building dapps. The company is also introducing a tool that will help in sharing digital assets. Technology is changing rapidly. To adopt this changing technology we need to think like a robot. We need to adopt the latest technology. The 4th generation blockchain technology is not the end of blockchain technology. We will witness more blockchain generations in the future. You must plan to shift your business to the blockchain. Not today, but you have to adopt the blockchain technology in the near future. Share this article with your friends and fellows to let them know the 4th generation blockchain. Are you also looking for 5th generation blockchain? Don’t forget to share your views regarding blockchain generations in the comment section.